I usually only go to CitySuper as last resort. Of all supermarkets I perceive this chain to be the most expensive and since I am a thrifty bugger I go to other supermarkets first. My quest for sauerkraut which did not contain any fructose up to that point was fruitless at the other stores. 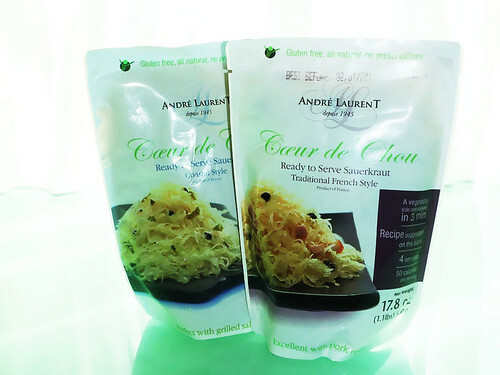 I therefore popped by CitySuper and I stumbled upon André Laurent Coeur de Chou - Ready to Serve Sauerkraut. It looked all fancy in that white pouch and well.... very French. German sauerkraut is presented more rustic in a burly glass jar or can and is sometimes for my taste a bit too sour. Well, I decided to give the fancy French seasoned sauerkraut a chance. 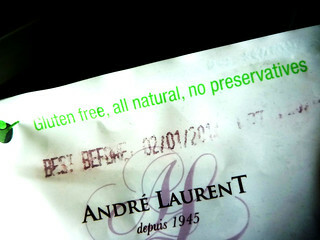 Two flavours were available: Coastal and French style. I bought both for around HKD 24.00 each. Both flavours are gluten-free, contain neither preservatives nor fructose. The Coastal flavour does contain a bit of sun flower oil but I was ok with that. Coeur de Chou had a milder taste than German sauerkraut and was more balanced because of it's seasoning. Therefore it's easier to pair it with seafood, eggs and any kind of meat, not only pork knuckle. Coastal style is seasoned with seaweed and the French style contained bits of bacon which made both sauerkraut flavours more umami tasting. The German in me does not like to admit it but the Frenchies did a decent job with this one.